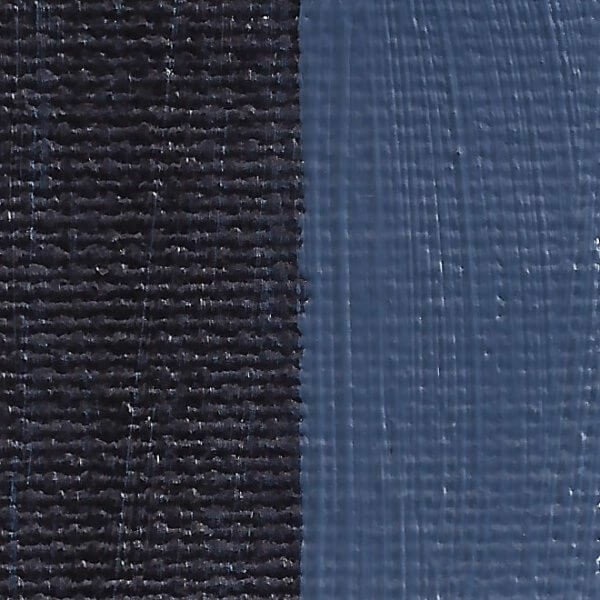 Rublev Colours Maya Blue is a translucent black-blue with high tinting strength, fine grained and a 'short' buttery paint. Maya blue is indigo on a base of palygorskite clay (formerly attapulgite) that are the principal components. (Gettens, 1962; van Olphen, 1966; Kleber, et al., 1967) This produced a remarkably stable pigment used by the ancient Mesoamericans. Rublev Colours Maya Blue is ground in linseed oil without the use of stearates or other additives that affect the behavior of the pigment in oil. The pale linseed oil used to make this color is well aged and refined to provide higher levels of reactivity and oxidation than raw oil. The consistency is a smooth, thick, rich color that is 'short' and buttery. 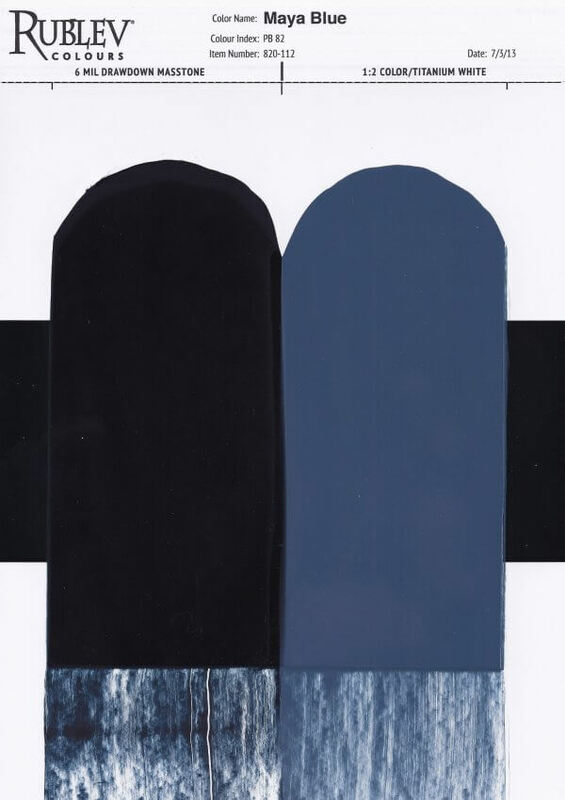 Note: The scan of the "drawdown" (above) contains a pre-mixed paint film of 6 mil (0.006 inch) thickness applied to a standard test card for the purposes of examining color consistency, opacity and other qualities. 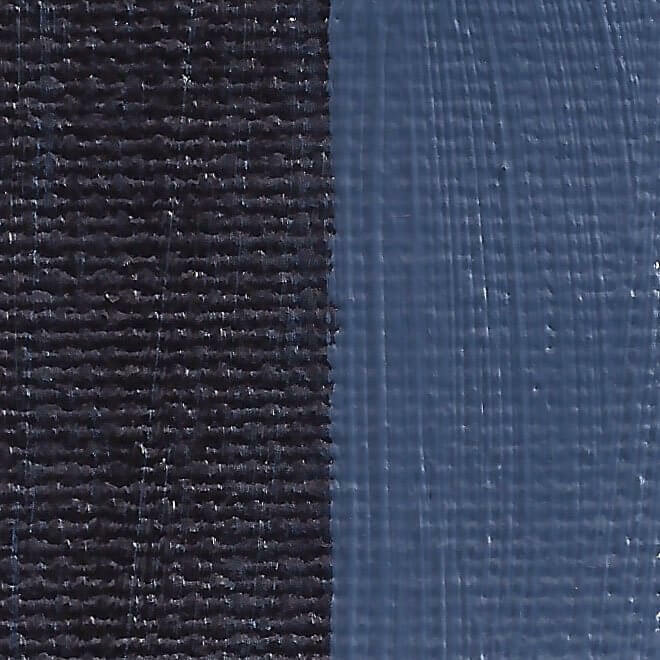 The drawdowns show the color full strength (mass tone), on the left, and mixed in a 1:2 ratio with titanium white on the right. The bottom area of the drawdowns are scraped to show undertones.